Come and see our range of Alps Spas, Viking Spas, Cedar Barrel Saunas and Timber Gazebos. We all love enjoying a Spa or hot tub, it’s relaxing just by yourself and to enjoy your with children, friends and family it can truly bring people closer together but Every Spa or Hot tub has a big invisible problem which can be very bad your health and the components in the Spa. New for 2016 12 months interest free credit on all hot tubs and spas, subject to credit check and status. The White Pavilion range of gazebos are contemporary styled permanent garden structures. 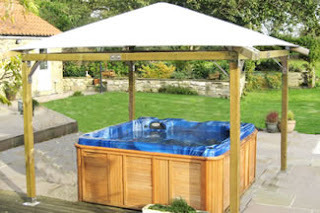 Their modern appearance comes from a tensioned PVC waterproof membrane covering a robust wooden framework jointed with exposed stainless steel fastenings and bolts and come in a range of sizes to suit all garden types.The White Pavilion gazebos will provide protection from the sun, wind and rain to give you the guarantee of enjoying the outdoors throughout the year – whatever the weather. 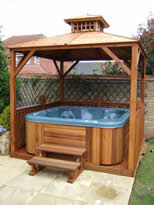 We have a selection of 8 top quality Gazebos for you to choose from all designed to enhance your hot tub or spa. You may wish to purchase a Gazebos just to enhance your garden, giving a shaded area to enjoy those summer days and relax in style. The delivery is a kerbside delivery at your requested address. The gazebo will arrive flat packed for home self assembly with instructions included. This will be a 2 person project and will take approximately a day to complete. Delivery on some gazebos will be 21/28 days please contact for exact delivery times, some will be stock items and can be dispatched within 48hrs. Are you looking for a chemical free hot tub water treatment, well now you have found one. Spa Hot Tub water sanitiser - made simple and environmentally friendly! This remarkable formula keeps your spa hot tub water clean, sparkling bright and fresh with no harsh chemicals or irritating odours for 90 days. These powerful yet gentle cleansers remove contaminants to eliminate unsightly scum and foam and prevents scale or mineral deposits from forming. Forget the shower after use, as Aquasafe leaves your skin feeling clean, soft and velvety smooth. 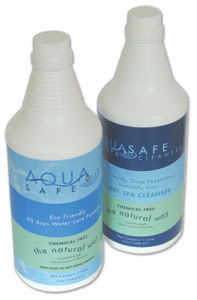 With no corrosive chemicals in Aquasafe to cause rust, stains or tainted water, your pump, filter, heater and every part of your Spa in contact with the water will look better and last longer. Simply add the Aquasafe and shock* your water once a week to help breakdown the non organic matter. Change the water after 3 months. FREE from daily maintenance and testing - NO more test kits! Save water, don't waste a valuable asset - Drain your spa water directly on garden! * The weekly shock can be carried out using a chlorine or non chlorine shock treatment. Ideal portable hot tub spa to be used at home or being totally portable for use in a holiday home or at your caravan site, all the fun of a hot at a fraction of the cost. The Camaro is only £495 delivered to your door. The fantastic new Camaro from the hugely respected Chinese exporter, ORPC (the Oriental Recreational Products Company - Shanghai) was available in the UK for the first time in 2008 and was a huge success. sales are set to rocket this year! There are two MSpas available in the UK, the Camaro and the Blue Sea. Both MSpas benefits from the patented I-beam internal air chamber structure giving unparalleled strength and rigidity to the spa and making MSpas much more robust than other inflatable spas on the UK market. These spas also have a more powerful blower than the other inflatable spas available and more air jets (128 rather than 80). An important new feature for 2009 is that the Camaro air blower is now heated, meaning that the water doesn't go cold as soon as you turn the bubbles on. There is no other inflatable spa on the market with this great feature. Another great feature of the Camaro is the inflatable, insulating cover which keeps the heat in and ensure that your electricity bills are kept to a minimum. In our opinion this is an absolute 'must have' for any inflatable spa used in the UK climate. The Camaro is backed by a full 12 month electrical warranty, UK technical helpline and a full parts service. All product is replaced without quibble should a fault occur during the warranty period. It is also supplied with a 6 month shell warranty, longer than most other inflatable spas. 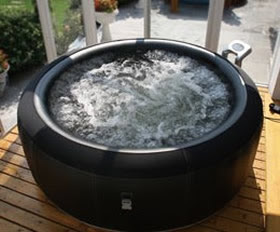 About Leicester Hot Tub Hire Ltd & Sales Leicestershire's premier for hot tub and spa hire, sales, chemicals and accessories. Quality second to none at prices second to most. A family run company operating from our Leicestershire base supplying hot tubs and spas for hire and sale throughout the surrounding counties of Lincolnshire, Nottinghamshire, Derbyshire, Warwickshire, Northamptonshire, Rutland and Staffordshire whilst also offering a delivery service to all UK Mainland destinations, coupled with excellent sales and after sales service. We are also proud to be authorized installers of luxury Sapphire Spas which start from only £4250 inc VAT delivered and installed. We offer top quality products at competitive prices but still focusing on customer satisfaction and after sales service. Leicester Hot Tub Hire Ltd are the sole UK distributors of the Alps Spas manufactured by Alps Spas USA, these are excellent quality and value for money spas that will grace any garden or home.